Instead of posting all of the “legends,” “myths,” and stories here, I’ve decided to make them available in print form, and have branded the series Don’t Blame the Knuckleballer! Baseball Legends, Myths, and Stories. I realized that if I were to start posting the legends and stories here, I would have to update it every so often and instead of doing so, I decided to gather as many as I can and then make them available all at once in print. The first series – or volume, if you will – has been completed and available on Amazon.com. * Did Joe Niekro really strike out the first five batters of a game in the very first inning? * Did Phil Niekro really make Floyd Robinson silly on a strikeout? * Did “Sunday Teddy” Lyons really pitch only on Sundays? * How did Tom Candiotti “botch” the Jeff Kent fantasy baseball story? * Did Pedro Martinez actually forget the details of his first big-league start and blame the wrong guy? * Did you know that Ted Williams had to face a knuckleballer on the next-to-last day of his historic 1941 season? * Was Mark Grace really on deck when Glenallen Hill hit his mammoth home run at Wrigley? * Who was the last starting pitcher ever in the majors to pitch only two innings in a game – and leave because of an injury – and then receive credit for an “injury win”? * Which knuckleballer once threw a shutout to beat Greg Maddux? * Which knuckleballer was the second pitcher ever in big-league history to have two consecutive starts of eight-plus innings and zero runs to begin his postseason career? * Which knuckleballer was said to have had “one of the most courageous pitching performances” of the 1939 major-league season – and why? * Which future Hall of Famer who was teammates with Bobby Witt made his pitching debut with his new club by entering in relief in a bases-loaded situation? 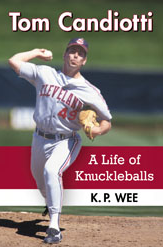 In Don’t Blame the Knuckleballer II, I look at more than 20 additional obscure and forgotten tales told by ballplayers, coaches, and broadcasters throughout baseball history – and repeated by fans, historians, and bloggers – while mixing in a knuckleballing theme. Thank you for picking up a copy of each book – I really appreciate your support!